From Inner to Outer: Digression: Books I'm Reviewing—Charlotte Gray's "The Massey Murder: A Maid, Her Master and the Trial that Shocked a Country"
Digression: Books I'm Reviewing—Charlotte Gray's "The Massey Murder: A Maid, Her Master and the Trial that Shocked a Country"
In The Massey Murder Charlotte Gray describes a murder that took place on a chilly Toronto evening in February 1915. 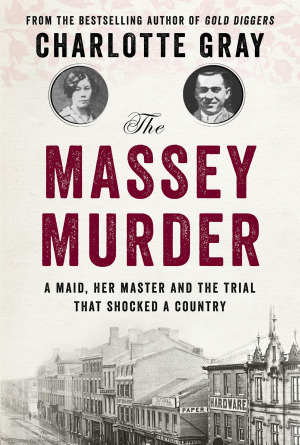 A young maid shot her employer—who happened to be a car salesman and, more importantly, a lesser branch of an influential and image-conscious bourgeois family in a city that was experiencing growing pains as it reluctantly left Victorian standards behind and embraced modernity. With an abundant "list of characters"—temperamental men of substance with axes to grind, arrogant court officers, theatrical lawyers, dogged and bigoted newspapermen, society ladies with vested interests, and one "timid eighteen-year-old" domestic servant who left no written accounts—Gray spins an endlessly intriguing account that satisfies a reader's need for dramatic intrigue with a procedural slant. A lesser storyteller could have made the story interesting enough, but Gray's artful rendition of the times, the city, and the wonderfully (soap) operatic cast with schemes aplenty makes the book a deeply satisfying read from Chapter 1 ("Bang!") to the thoughtful final section ("Aftermath"). "In 1912, during another typhoid outbreak, the Star sponsored a "Swat the Fly" contest in an attempt to reduce the spread of disease from garbage to food. A girl named Beatrice Webb collected the prize after killing 543,360 flies." The number of hours she dedicated to the search for over 500,000 flies remains undisclosed.